American astronomer mission specialist astronaut 1978-2008. Was married to astronaut Sally Ride. Status: Inactive; Active 1978-2008. Born: 1951-12-12. Spaceflights: 5 . Total time in space: 32.11 days. Birth Place: Ottawa, Kansas. Hawley was an extremely intelligent astrophysicist with a near-photographic memory that could recall shuttle schematics and checklists at will. It was said to have him on a mission was like having a sixth General Purpose Computer aboard. A sports addict, he was also trained as a professional baseball umpire. Called the Attack Astronomer by the military pilot astronauts. Nicknamed Cheetah to Mullane's Tarzan after the duo's infamously fawning encounter with Bo Derek during the filming of Tarzan the Ape Man. PERSONAL DATA: Born December 12, 1951, in Ottawa, Kansas, but considers Salina, Kansas, to be his hometown. Married to the former Eileen M. Keegan of Redondo Beach, California. He enjoys golf and watching baseball. His parents, Dr. and Mrs. Bernard Hawley, reside in Surprise, Arizona. 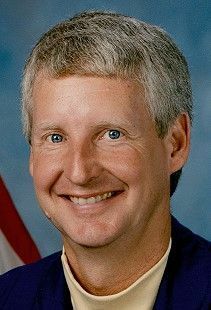 EDUCATION: Graduated from Salina (Central) High School, Salina, Kansas, in 1969; received bachelor of arts degrees in physics and astronomy (graduating with highest distinction) from the University of Kansas in 1973, and a doctor of philosophy in astronomy and astrophysics from the University of California in 1977. ORGANIZATIONS: Member of the American Astronomical Society, the Astronomical Society of the Pacific, the American Institute of Aeronautics and Astronautics, the Association of Space Explorers, the American Astronautical Association, Sigma Pi Sigma, and Phi Beta Kappa. SPECIAL HONORS: Evans Foundation Scholarship, 1970; University of Kansas Honor Scholarship, 1970; Summerfield Scholarship, 1970-1973; Veta B. Lear Award, 1970; Stranathan Award, 1972; Outstanding Physics Major Award, 1973; University of California Regents Fellowship, 1974; Group Achievement Award for software testing at the Shuttle Avionics Integration Laboratory, 1981; NASA Outstanding Performance Award, 1981; NASA Superior Performance Award, 1981; Group Achievement Award for Second Orbiter Test and Checkout at Kennedy Space Center, 1982; Quality Increase, 1982; NASA Space Flight Medal (1984, 1986, 1990, 1997, 1999); Group Achievement Award for JSC Strategic Planning, 1987; NASA Exceptional Service Medal (1988, 1991); Special Achievement Award, 1988; Exceptional Service Medal for Return to Flight, 1988; Outstanding Leadership Medal, 1990; Special Achievement Award, 1990; Haley Flight Achievement Award, 1991; Kansan of the Year Award, 1992; Group Achievement Award for ESIG 3000 Integration Project, 1994; Presidential Rank Award (1994, 1999); Group Achievement Award for Space Shuttle Program Functional Workforce Review, 1995; Group Achievement Award for SFOC Contract Acquisition, 1997; Kansas Aviation Hall of Fame, 1997; Kansas University Distinguished Service Citation, 1998; NASA Distinguished Service Medal (1998, 2000); Aviation Week and Space Technology Laurel Citation for Space, 1998, V.M. Komarov Diploma from the FAI (Federation Aeronautique Internationale) (1998, 2000, Alumni Distinguished Achievement Award (Univesity of Kansas), 2007, Astronaut Hall of Fame Inductee, 2007. EXPERIENCE: Hawley attended the University of Kansas, majoring in physics and astronomy. He spent three summers employed as a research assistant: 1972 at the U.S. Naval Observatory in Washington, D.C., and 1973 and 1974 at the National Radio Astronomy Observatory in Green Bank, West Virginia. He attended graduate school at Lick Observatory, University of California, Santa Cruz. His research involved spectrophotometry of gaseous nebulae and emission-line galaxies with particular emphasis on chemical abundance determinations for these objects. The results of his research have been published in major astronomical journals. Prior to his selection by NASA in 1978, Hawley was a post-doctoral research associate at Cerro Tololo Inter-American Observatory in La Serena, Chile. NASA EXPERIENCE: Dr. Hawley was selected as a NASA astronaut in January 1978. Prior to STS-1, he served as a simulator pilot for software checkout at the Shuttle Avionics Integration Laboratory (SAIL). For STS-2, STS-3, and STS-4, he was a member of the astronaut support crew at Kennedy Space Center, Florida, for Orbiter test and checkout, and also served as prime close-out crewman for STS-3 and STS-4. During 1984-1985, he was Technical Assistant to the Director, Flight Crew Operations. From 1987-1990, he was the Deputy Chief of the Astronaut Office. In June 1990, he left the Astronaut Office to assume the post of Associate Director of NASA’s Ames Research Center in California. In August 1992, he returned to the Johnson Space Center as Deputy Director of Flight Crew Operations. Dr. Hawley was returned to astronaut flight status in February 1996. He served on the second Hubble Space Telescope mission and returned to duty as Deputy Director, Flight Crew Operations. From October 2001 to November 2002, Dr. Hawley served as Director, Flight Crew Operations. From 2003 to 2004, Dr. Hawley also served as the First Chief Astronaut for the NASA Engineering and Safety Center. From 2002 to 2008 he served as Director, Astromaterials Research and Exploration Science Directorate. Dr. Hawley was responsible for directing a scientific organization conducting research in planetary and space science. The primary functions of the organization included astromaterials acquisition and curation, astromaterials research, and human exploration science. A veteran of five space flights (STS-41D in 1984, STS-61C in 1986, STS-31 in 1990, STS-82 in 1997 and STS-93 in 1999), Dr. Hawley logged 32 days in space. Dr. Hawley retired from NASA in May 2008. SPACE FLIGHT EXPERIENCE: Dr. Hawley has logged a total of 770 hours and 27 minutes in five space flights. He served as a mission specialist on STS-41D in 1984, STS-61C in 1986, STS-31 in 1990, STS-82 in 1997 and STS-93 in 1999. STS-41D Discovery (August 30 to September 5, 1984) was launched from the Kennedy Space Center, Florida, and returned to land at Edwards Air Force Base, California. This was the maiden flight of the Space Shuttle Discovery. During the 7-day mission the crew successfully activated the OAST-1 solar cell wing experiment, deployed the SBS-D, SYNCOM IV-2, and TELSTAR 3-C satellites, operated the CFES-III experiment, the student crystal growth experiment, as well as photography experiments using the IMAX motion picture camera. The mission was completed in 96 orbits of the Earth in 144 hours and 57 minutes. STS-61C Columbia (January 12-18, 1986) was launched from the Kennedy Space Center, Florida, and returned to a night landing at Edwards Air Force Base, California. During the 6-day flight the crew deployed the SATCOM KU satellite and conducted experiments in astrophysics and materials processing. Mission duration was 146 hours and 03 minutes. STS-31 Discovery (April 24-29, 1990) was launched from the Kennedy Space Center in Florida, and also returned to land at Edwards Air Force Base, California. During the 5-day mission, the crew deployed the Hubble Space Telescope, and conducted a variety of middeck experiments involving the study of protein crystal growth, polymer membrane processing, and the effects of weightlessness and magnetic fields on an ion arc. They also operated a variety of cameras, including both the IMAX in-cabin and cargo bay cameras, for Earth observations from their record-setting altitude of 380 miles. The mission was completed in 76 orbits of the earth in 121 hours. STS-82 Discovery (February 11-21, 1997) the second Hubble Space Telescope (HST) maintenance mission, was launched at night and returned to a night landing at Kennedy Space Center, Florida. During the flight, Dr. Hawley’s primary role was to operate the Shuttle’s 50-foot robot arm to retrieve and redeploy the HST following completion of upgrades and repairs. Dr. Hawley also operated the robot arm during five space walks in which two teams installed two new spectrometers and eight replacement instruments. They also replaced insulation patches over three compartments containing key data processing, electronics and scientific instrument telemetry packages. HST was then redeployed and boosted to a higher orbit. The flight was completed in 149 orbits covering 3.8 million miles in 9 days, 23 hours, 37 minutes. STS-93 Columbia (July 22-27, 1999) was launched from the Kennedy Space Center on a 5-day mission returning to KSC for the 12th night landing in the Shuttle Program’s history. Dr. Hawley served as Columbia’s flight engineer. The primary mission objective was the successful deployment of the Chandra X-ray Observatory, the third of NASA’s Great Observatories after Hubble Space Telescope and the Compton Gamma Ray Observatory. Dr. Hawley also served as the primary operator of a second telescope carried in the crew module which was used for several days to make broadband ultraviolet observations of a variety of solar system objects. The mission completed 79 orbits in 4 days, 22 hours, and 50 minutes. Dr. Hawley is a Professor of Physics and Astronomy at the University of Kansas. This is the only version available from NASA. Updates must be sought direct from the above named individual. Born December 12, 1951, in Ottawa, Kansas, but considers Salina, Kansas, to be his hometown. Married to the former Eileen M. Keegan of Redondo Beach, California. He enjoys basketball, softball, golf, running, playing bridge, and umpiring. His parents, Dr. and Mrs. Bernard Hawley, reside in Surprise, Arizona. Her mother, Mrs. Jo Keegan, resides in Houston, Texas. Graduated from Salina (Central) High School, Salina, Kansas, in 1969; received bachelor of arts degrees in physics and astronomy (graduating with highest distinction) from the University of Kansas in 1973, and a doctor of philosophy in astronomy and astrophysics from the University of California in 1977. Member of the American Astronomical Society, the Astronomical Society of the Pacific, the American Institute of Aeronautics and Astronautics, Sigma Pi Sigma, and Phi Beta Kappa. Evans Foundation Scholarship, 1970; University of Kansas Honor Scholarship, 1970; Summerfield Scholarship, 1970-1973; Veta B. Lear Award, 1970; Stranathan Award, 1972; Outstanding Physics Major Award, 1973; University of California Regents Fellowship, 1974; Group Achievement Award for software testing at the Shuttle Avionics Integration Laboratory, 1981; NASA Outstanding Performance Award, 1981; NASA Superior Performance Award, 1981; Group Achievement Award for Second Orbiter Test and Checkout at Kennedy Space Center, 1982; Quality Increase, 1982; NASA Space Flight Medals, 1984 & 1986; Group Achievement Award for JSC Strategic Planning, 1987; NASA Exceptional Service Medal, 1988; Special Achievement Award, 1988; Exceptional Service Medal for Return to Flight, 1988; NASA Space Flight Medal, 1990; Outstanding Leadership Medal, 1990; Special Achievement Award, 1990; Exceptional Service Medal, 1991; Haley Flight Achievement Award, 1991; Kansan of the Year Award, 1992; Group Achievement Award for ESIG 3000 Integration Project, 1994; Presidential Rank Award, 1994. Hawley attended the University of Kansas, majoring in physics and astronomy. He spent three summers employed as a research assistant: 1972 at the U.S. Naval Observatory in Washington, D.C., and 1973 and 1974 at the National Radio Astronomy Observatory in Green Bank, West Virginia. He attended graduate school at Lick Observatory, University of California, Santa Cruz. His research involved spectrophotometry of gaseous nebulae and emission-line galaxies with particular emphasis on chemical abundance determinations for these objects. The results of his research have been published in major astronomical journals. Prior to his selection by NASA in 1978, Hawley was a post-doctoral research associate at Cerro Tololo Inter-American Observatory in La Serena, Chile. Dr. Hawley was selected as a NASA astronaut in January 1978. Prior to STS-1, he served as a simulator pilot for software checkout at the Shuttle Avionics Integration Laboratory (SAIL). For STS-2, STS-3, and STS-4, he was a member of the astronaut support crew at Kennedy Space Center, Florida, for Orbiter test and checkout, and also served as prime close-out crewman for STS-3 and STS-4. During 1984-1985, he was Technical Assistant to the Director, Flight Crew Operations. From 1987-1990, Dr. Hawley was Deputy Chief of the Astronaut Office. In June 1990, Dr. Hawley left the Astronaut Office to assume the post of Associate Director of NASA's Ames Research Center in California. In August 1992, Dr. Hawley returned to the Johnson Space Center as Deputy Director of Flight Crew Operations. In February 1996, Dr. Hawley was returned to astronaut flight status and named to the crew of the second Hubble Space Telescope servicing mission. A veteran of four space flights, Dr. Hawley has logged a total of 651 hours and 37 minutes in space. He served as a mission specialist on STS-41D in 1984, STS-61C in 1986, STS-31 in 1990 and STS-82 in 1997. STS-41D launched from the Kennedy Space Center, Florida, on August 30, 1984. Crew members included Hank Hartsfield (spacecraft commander), Mike Coats (pilot), Judy Resnik and Mike Mullane (mission specialists), and Charlie Walker (payload specialist). This was the maiden flight of the Space Shuttle Discovery. During the 7-day mission the crew successfully activated the OAST-1 solar cell wing experiment, deployed the SBS-D, SYNCOM IV-2, and TELSTAR 3-C satellites, operated the CFES-III experiment, the student crystal growth experiment, as well as photography experiments using the IMAX motion picture camera. STS-41D completed 96 orbits of the Earth in 144 hours and 57 minutes before landing at Edwards Air Force Base, California, on September 5, 1984. STS-61C launched from the Kennedy Space Center, Florida, on January 12, 1986. Crew members included Robert "Hoot" Gibson (spacecraft commander), Charles Bolden (pilot), Franklin Chang-D�az and George "Pinky" Nelson (mission specialists), Robert Cenker of RCA, and Congressman Bill Nelson (payload specialists). During the 6-day flight of Columbia the crew deployed the SATCOM KU satellite and conducted experiments in astrophysics and materials processing. Mission duration was 146 hours and 03 minutes. STS-61C made a successful night landing at Edwards Air Force Base, California, on January 18, 1986. STS-31 launched on April 24, 1990, from the Kennedy Space Center in Florida. The crew aboard Space Shuttle Discovery included Loren Shriver (spacecraft commander), Charlie Bolden (pilot), Bruce McCandless and Kathy Sullivan (mission specialists). During the 5-day mission, crew members deployed the Hubble Space Telescope, and conducted a variety of middeck experiments involving the study of protein crystal growth, polymer membrane processing, and the effects of weightlessness and magnetic fields on an ion arc. They also operated a variety of cameras, including both the IMAX in-cabin and cargo bay cameras, for Earth observations from their record-setting altitude of 380 miles. Following 76 orbits of the earth in 121 hours, Discovery landed at Edwards Air Force Base, California, on April 29, 1990. STS-82, the second Hubble Space Telescope (HST) maintenance mission, launched at night on February 11 and returned to a night landing at Kennedy Space Center on February 21, 1997. During the flight, Dr. Hawley's primary role was to operate the Shuttle's 50-foot robot arm to retrieve and redeploy the HST following completion of upgrades and repairs. Dr. Hawley also operated the robot arm during five space walks in which two teams installed two new spectrometers and eight replacement instruments. They also replaced insulation patches over three compartments containing key data processing, electronics and scientific instrument telemetry packages. HST was then redeployed and boosted to a higher orbit. The flight was completed in 149 orbits covering 3.8 million miles in 9 days, 23 hours, 37 minutes. Departed Date: 2008-02-27. Degree: PhD. Marital Status: Married. Childhood: Grew up in Salina, Kansas, son of a physician.. Education: Kansas;UC. Family: Astronaut. Country: USA. Flights: STS-12, STS-41-D, STS-61-C, STS-61-J, STS-31, STS-82, STS-93. Projects: STS. Bibliography: 12, 4457, 5498. 1951 December 12 - . Birth of Dr Steven Alan Hawley - . Nation: USA. Related Persons: Hawley. American astronomer mission specialist astronaut 1978-2008. Was married to astronaut Sally Ride. 5 spaceflights, 32.1 days in space. Flew to orbit on STS-41D (1984), STS-61C, STS-31, STS-82, STS-93..
1978 January 16 - . NASA Astronaut Training Group 8 selected. - . Nation: USA. Related Persons: Bluford, Brandenstein, Buchli, Coats, Covey, Creighton, Fabian, Fisher, Gardner, Gibson, Gregory, Griggs, Hart, Hauck, Hawley, Hoffman, Lucid, McBride, McNair, Mullane, Nagel, Nelson, Onizuka, Resnik, Ride, Scobee, Seddon, Shaw, Shriver, Stewart, Sullivan. The group was selected to provide pilot, engineer, and scientist astronauts for space shuttle flights. Recruit women and minorities to introduce diversity into the astronaut corps. Qualifications: Pilots: Bachelor's degree in engineering, biological science, physical science or mathematics. Advanced degree desirable. At least 1,000 flight-hours of pilot-in-command time. Flight test experience desirable. Excellent health. Vision minimum 20/50 uncorrected, correctable to 20/20 vision; maximum sitting blood pressure 140/90. Height between 163 and 193 cm. Mission Specialists: Bachelor's degree in engineering, biological science, physical science or mathematics and minimum three years of related experience or an advanced degree. Vision minimum 20/150 uncorrected, correctable to 20/20. Maximum sitting blood pressure of 140/90. Height between 150 and 193 cm.. 8,079 applicants, of which half met the basic qualifications. 208 invited for physical tests and interviews. Of the 35 selected, six were women, three were male African-Americans, and one was a male Asian-American. STS-12 (cancelled) - . Crew: Coats, Hartsfield, Hawley, Mullane, Resnik. Payload: TDRS/IUS. Nation: USA. Related Persons: Coats, Hartsfield, Hawley, Mullane, Resnik. Program: STS. Flight: STS-12. Planned TDRS/IUS deployment shuttle mission. Cancelled after IUS failures..
1984 August 30 - . 12:41 GMT - . Launch Site: Cape Canaveral. Launch Complex: Cape Canaveral LC39A. Launch Platform: MLP2. LV Family: Shuttle. Launch Vehicle: Space Shuttle. STS-41-D - . Call Sign: Discovery. Crew: Coats, Hartsfield, Hawley, Mullane, Resnik, Walker. Payload: Discovery F01 / SBS 4[PAM-D] / Telstar 302[PAM-D]. Mass: 21,552 kg (47,514 lb). Nation: USA. Related Persons: Coats, Hartsfield, Hawley, Mullane, Resnik, Walker. Agency: NASA Houston. Program: STS. Class: Manned. Type: Manned spaceplane. Flight: STS-41-D. Spacecraft Bus: Shuttle. Spacecraft: Discovery. Duration: 6.04 days. Decay Date: 1984-09-05 . USAF Sat Cat: 15234 . COSPAR: 1984-093A. Apogee: 307 km (190 mi). Perigee: 300 km (180 mi). Inclination: 28.50 deg. Period: 90.60 min. Manned six crew. First flight of space shuttle Discovery; deployed SBS 4, Leasat 1, Telstar 3C. Payloads: Satellite Business System (SBS)-D commu-nications satellite with Payload Assist Module (PAM)-D deployment, Syncom IV-2 communica-tions satellite with its unique stage deployment, Telstar (American Telephone and Telegraph) 3-C with PAM-D deployment, Office of Aeronautics and Space Technology (OAST)-1 experiments. Deployment and restowing of large solar array. Continuous Flow Electrophoresis (CFES). IMAX camera. 1984 September 5 - . Landing of STS-41-D - . Return Crew: Coats, Hartsfield, Hawley, Mullane, Resnik, Walker. Nation: USA. Related Persons: Coats, Hartsfield, Hawley, Mullane, Resnik, Walker. Program: STS. Flight: STS-41-D. STS-41-D landed at 13:39 GMT. .
1986 January 12 - . 11:55 GMT - . Launch Site: Cape Canaveral. Launch Complex: Cape Canaveral LC39A. Launch Platform: MLP1. LV Family: Shuttle. Launch Vehicle: Space Shuttle. STS-61-C - . Call Sign: Columbia. Crew: Bolden, Cenker, Chang-Diaz, Gibson, Hawley, Nelson, Nelson, Bill. Payload: Columbia F07 Satcom-K 1 [PAM-D2]. Mass: 14,724 kg (32,460 lb). Nation: USA. Related Persons: Bolden, Cenker, Chang-Diaz, Gibson, Hawley, Nelson, Nelson, Bill. Agency: NASA Houston. Program: STS. Class: Manned. Type: Manned spaceplane. Flight: STS-61-C. Spacecraft Bus: Shuttle. Spacecraft: Columbia. Duration: 6.09 days. Decay Date: 1986-01-18 . USAF Sat Cat: 16481 . COSPAR: 1986-003A. Apogee: 338 km (210 mi). Perigee: 331 km (205 mi). Inclination: 28.50 deg. Period: 91.20 min. Manned seven crew. Launched Satcom K1. Payloads: Deploy SATCOM (RCA-Satellite Communi-cations) Ku-1 with Payload Assist Module (PAM)-D II. Materials Science Laboratory, Comet Halley Active Monitoring Experiment (CHAMP), Hitchhiker (HH) Goddard (G)-1, thirteen getaway specials (GAS), student experiment, Initial Blood Storage Equipment (lBSE), Characterization of Space Motion Sickness (SMS). 1986 January 18 - . Landing of STS-61-C - . Return Crew: Bolden, Cenker, Chang-Diaz, Gibson, Hawley, Nelson, Nelson, Bill. Nation: USA. Related Persons: Bolden, Cenker, Chang-Diaz, Gibson, Hawley, Nelson, Nelson, Bill. Program: STS. Flight: STS-61-C. STS-61-C landed at 13:59 GMT. .
STS-61-J (cancelled) - . Crew: Bolden, Hawley, McCandless, Sullivan, Young. Payload: Hubble. Nation: USA. Related Persons: Bolden, Hawley, McCandless, Sullivan, Young. Program: STS. Flight: STS-61-J. Spacecraft: Atlantis, HST. Planned shuttle mission for deployment of Hubble space telescope. Cancelled after Challenger disaster. .
1990 April 24 - . 12:33 GMT - . Launch Site: Cape Canaveral. Launch Complex: Cape Canaveral LC39B. Launch Platform: MLP2. LV Family: Shuttle. Launch Vehicle: Space Shuttle. STS-31 - . Call Sign: Discovery. Crew: Bolden, Hawley, McCandless, Shriver, Sullivan. Payload: Discovery F10 / Hubble Space Telescope. Mass: 13,005 kg (28,671 lb). Nation: USA. Related Persons: Bolden, Hawley, McCandless, Shriver, Sullivan. Agency: NASA Houston. Program: STS. Class: Manned. Type: Manned spaceplane. Flight: STS-31. Spacecraft Bus: Shuttle. Spacecraft: Discovery. Duration: 5.05 days. Decay Date: 1990-04-29 . USAF Sat Cat: 20579 . COSPAR: 1990-037A. Apogee: 615 km (382 mi). Perigee: 585 km (363 mi). Inclination: 28.50 deg. Period: 96.70 min. Deployed HST (Hubble Space Telescope). Payloads: Deployment of Hubble Space Telescope, IMAX camera in payload bay and in crew compartment, Protein Crystal Growth III-03, Investigation Into Polymer Membrane Process-ing- 01, Air Force Maui Optical Site-05, Radiation Monitoring Equipment III-01, Student Experiment 82-16, and Ascent Particle Monitor 01. 1990 April 29 - . Landing of STS-31 - . Return Crew: Bolden, Hawley, McCandless, Shriver, Sullivan. Nation: USA. Related Persons: Bolden, Hawley, McCandless, Shriver, Sullivan. Flight: STS-31. STS-31 landed at 13:44 GMT. .
1997 February 11 - . 08:55 GMT - . Launch Site: Cape Canaveral. Launch Complex: Cape Canaveral LC39A. Launch Platform: MLP1. LV Family: Shuttle. Launch Vehicle: Space Shuttle. STS-82 - . Call Sign: Discovery. Crew: Bowersox, Harbaugh, Hawley, Horowitz, Lee, Smith, Steven, Tanner. Payload: Discovery F22 / SAC. Mass: 116,884 kg (257,685 lb). Nation: USA. Related Persons: Bowersox, Harbaugh, Hawley, Horowitz, Lee, Smith, Steven, Tanner. Agency: NASA Houston. Manufacturer: North American. Program: STS. Class: Manned. Type: Manned spaceplane. Flight: STS-82. Spacecraft Bus: Shuttle. Spacecraft: Discovery. Duration: 9.98 days. Decay Date: 1997-02-21 . USAF Sat Cat: 24719 . COSPAR: 1997-004A. Apogee: 618 km (384 mi). Perigee: 584 km (362 mi). Inclination: 28.50 deg. Period: 96.70 min. After a spectacular night launch, the Shuttle completed its rendezvous with Hubble Space Telescope on February 13. Over the next four days five spacewalks were undertaken to renovate Hubble. The Hubble Space Telescope was released back into orbit at 06:41 GMT on February 19. Discovery landed on Runway 15 at Kennedy Space Center at 08:32 GMT on February 21. 1997 February 21 - . Landing of STS-82 - . Return Crew: Bowersox, Harbaugh, Hawley, Horowitz, Lee, Smith, Steven, Tanner. Nation: USA. Related Persons: Bowersox, Harbaugh, Hawley, Horowitz, Lee, Smith, Steven, Tanner. Flight: STS-82. STS-82 landed at 08:32 GMT. .
1999 July 23 - . STS-93 Mission Status Report # 01 - . Nation: USA. Related Persons: Ashby, Coleman, Catherine, Collins, Eileen, Hawley, Jett, Tognini. Program: STS. Flight: STS-93. STS-93 Mission Status Report # 03 - . Nation: USA. Related Persons: Ashby, Coleman, Catherine, Collins, Eileen, Hawley, Tognini. Program: STS. Flight: STS-93. 1999 July 23 - . 04:31 GMT - . Launch Site: Cape Canaveral. Launch Complex: Cape Canaveral LC39B. Launch Platform: MLP1. LV Family: Shuttle. Launch Vehicle: Space Shuttle. STS-93 - . Call Sign: Columbia. Crew: Ashby, Coleman, Catherine, Collins, Eileen, Hawley, Tognini. Payload: Columbia F26 / Chandra. Mass: 115,900 kg (255,500 lb). Nation: USA. Related Persons: Ashby, Coleman, Catherine, Collins, Eileen, Hawley, Tognini. Agency: NASA Houston. Manufacturer: North American. Program: STS. Class: Manned. Type: Manned spaceplane. Flight: STS-93. Spacecraft Bus: Shuttle. Spacecraft: Columbia. Duration: 4.95 days. Decay Date: 1999-07-28 . USAF Sat Cat: 25866 . COSPAR: 1999-040A. Apogee: 280 km (170 mi). Perigee: 260 km (160 mi). Inclination: 28.50 deg. Period: 89.90 min. STS-93 was first rolled out to pad 39B on June 7 1999. The Chandra/IUS-27 vehicle was placed in the payload canister on June 19. The first launch attempt was on July 20, but controllers aborted the launch at T-6 seconds, just before main engine ignition, due to a data spike in hydrogen pressure data. This was determined to be due to a faulty sensor and a second attempt was on July 22. A lightning storm prevented launch during the 46 minute window, and the launch was again scrubbed. Finally the vehicle lifted off the pad on July 23, but five seconds after launch a short in an electrical bus brought down two of the three main engine controllers. Backup controllers took over, but a further failure on the backup controller bus would have resulted in engine shutdown and the first ever attempt at an RTLS (Return To Launch Site) abort. To further complicate matters engine 3 (SSME 2019) had a hydrogen leak throughout the ascent, causing the engine to run hot. Controllers sweated as temperatures neared redline. The hot engine's controller compensated as programmed by using additional liquid oxygen propellant. The final result was that the shuttle ran out of gas - main engine cut-off (MECO) was at 04:39 GMT, putting Columbia into a 78 km x 276 km x 28.5 degree transfer orbit. Columbia was 1,700 kg short of oxygen propellant and 5 meters/sec slower than planned. The OMS-2 engine burn at 05:12 GMT circularised the orbit 10 km lower than planned. The orbiter payload bay contained only the Chandra spacecraft, the IUS, and the IUS tilt tableTthe following payloads were carried in the shuttle's cabin: STL-B (Space Tissue Loss), CCM (Cell culture module), SAREX-II (Shuttle Amateur Radio Experiment), EarthKam, PGIM (Plant Growth Investigations in Microgravity), CGBA (Commercial Generic Bioprocessing Apparatus), MEMS (Micro-electric Mechanical System), and BRIC (Biological Research in Canisters) and SWUIS (the Southwest Ultraviolet Imaging System, an 0.18-m UV telescope to be used for airglow and planetary observations); GOSAMR (the Gelation of Sols: Applied Microgravity Research experiment) and LFSAH, the Lightweight Flexible Solar Array Hinge. MSX and SIMPLEX experiments were also to be carried out. Chandra/IUS-27 was deployed from Columbia at 11:47 GMT July 23. Flight duration was limited; this was the heaviest shuttle (122,534 kg) and heaviest payload (19,736 kg) to that date. Columbia landed at 03:20 GMT on July 28 on runway 33 at Kennedy Space Center. Post-flight inspection found the presence of holes in the cooling lines on the nozzle of SSME 2019 (engine 3) which caused a hydrogen leak. A loose repair pin in the engine broke free and caused the failure. The cause of the short was found to be chaffed wiring inside the shuttle. The entire fleet was grounded for inspection and replacement of wiring as necessary. 1999 July 24 - . STS-93 Mission Status Report # 04 - . Nation: USA. Related Persons: Ashby, Coleman, Catherine, Collins, Eileen, Hawley, Tognini. Program: STS. Flight: STS-93. 1999 July 25 - . STS-93 Mission Status Report # 06 - . Nation: USA. Related Persons: Ashby, Coleman, Catherine, Collins, Eileen, Hawley, Tognini. Program: STS. Flight: STS-93. 1999 July 26 - . 1999 July 27 - . STS-93 Mission Status Report # 11 - . Nation: USA. Related Persons: Ashby, Barry, Coleman, Catherine, Collins, Eileen, Hawley, Ross, Tognini. Program: STS. Flight: STS-93. 1999 July 28 - . Landing of STS-93 - . Return Crew: Ashby, Coleman, Catherine, Collins, Eileen, Hawley, Tognini. Nation: USA. Related Persons: Ashby, Coleman, Catherine, Collins, Eileen, Hawley, Tognini. Program: STS. Flight: STS-93. STS-93 landed at 03:17 GMT. .